Welcome to a brand new week filled with fun and creativity. Your sketch this week is brought to you by DeNami Design. Our Luscious Design Team has created the most amazing cards and you will get to see more of their work as we celebrate World Card Making Day at the end of the week too. We have a gorgeous Sponsor for you this week. DeNami Design is a fabulous Rubber Stamp and accessories company. Here you will find the most beautiful elegant stamps with coordinating paper and related products. 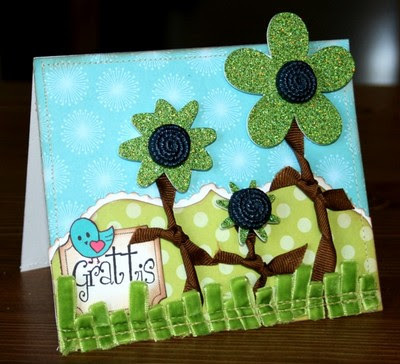 DeNami Design also features fabulous pre-marked Pop Up Cards to make creative pop-up cards easy. DeNami Design rubber stamps are known for their simply elegant style and appeal both to beginners and advanced rubber stampers alike. You will fall in love with Collections like Espresso, Golden Vines, The Sweet Shoppe and Tropical Dreams. They have just released their Fall/Winter 2008 collection and with over 50 stamps to choose from there will be something for everyone to enjoy. They are on tour too. If they are in your city stop by and say hello, they have the cutest booths and are so friendly. Tell them Laura and Kazan at 2 Sketches 4 You sent you! 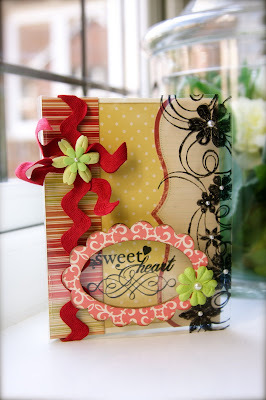 Now for the good news: One lucky card maker will get to win DeNami Design Products this week. • The winning card will be announced as the Card of the Week on Sunday, October 6th here at 2 Sketches 4 You. 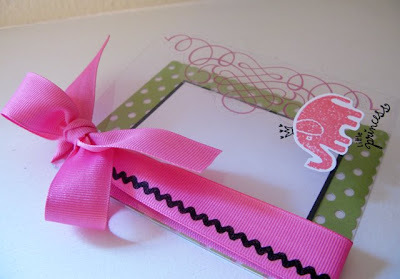 "This week we celebrate World Card Making Day on October 4. This Holiday is especially for us, card makers, and is celebrated around the world on the first Saturday of October. 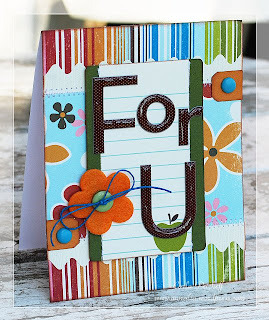 We here at 2s4y are teaming up with Scrapbook News & Review to celebrate the creativity of handmade cards and how they bring people and communities, like ours, together. Please join us and Scrapbook News and Review for an exciting day filled with activities, sketches and prizes. 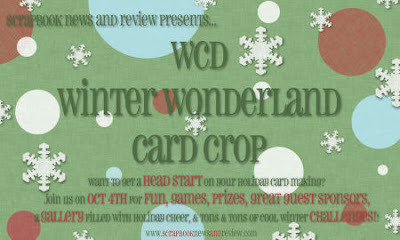 Mark your calenders for WCMD at 2S4Y on October 4!" 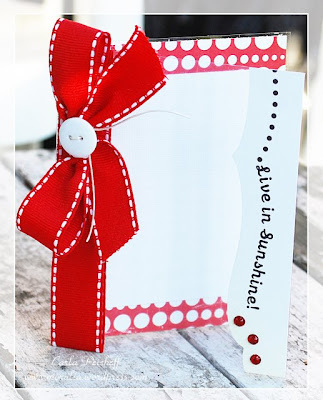 I love the light, whimsical feeling of this card. Carina's imagination and creativity really shines in this card! Thank you for making such a beautiful card with my sketch. Thank you ladies for your beautiful submissions! Remember we need the Fab5 to email us your addresses too because you also win this week! Tomorrow promises another fabulous sketch and sponsor by Kazan! 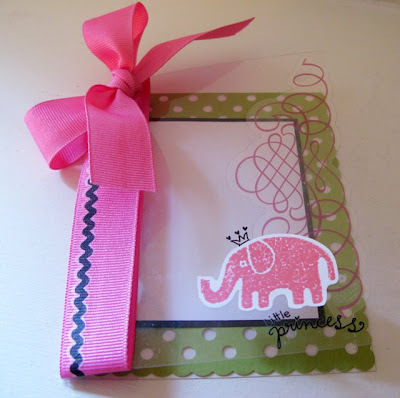 Did you know that today is National Elephant Appreciation Day! A whole day dedicated to appreciate this beautiful and enchanting beast. After working in Kindergarten for 6 years my ideas are just spilling over with "Elephant" related projects, from poems to songs to elephant cupcakes. Even a few famous elephants come to mind, the lovable Dumbo from Disney, and one of my favorite childhood books, Barbar the Elephant. 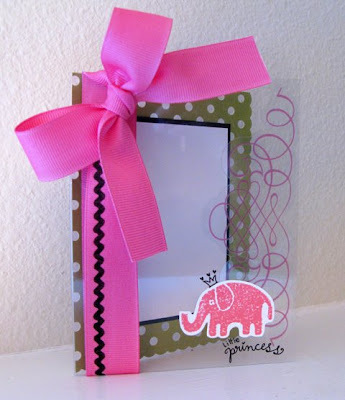 So in honor of one of my favorite animals, the pachyderm, I made this little card using a clear card supplied by this weeks sponsor, Short Cuts. Short Cuts also supplied our Pachyderm Loving Design Team with their amazing clear and frosted cards to work with and the team created the most amazing projects this week! Thank you DT & Short Cuts! 2S4Y is also featuring a Guest Designer this week! We found out that Hanneke is a famous for her Monchou cakes in the Netherlands. She loves to combine baking and scrapping and often takes her goodies to share at crops. According to Hanneke: "All Shared things are the best things and that applies to scrapping and baking!" We could not agree more with you on that Hanneke because we love that you share your amazing talent with us every week! This week is a special week sponsored by ShortCuts. 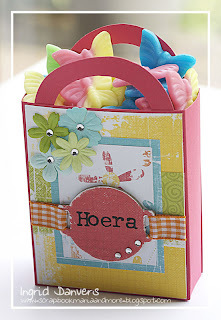 Launched in June of 2008, the sister site to SheetLoad of Cards is dedicated to making your papercrafting quicker and easier. 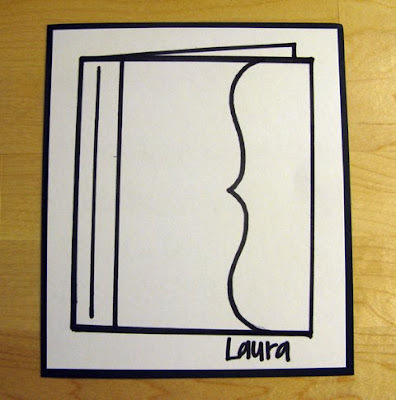 This is the same company that brought us the fabulous Gift Card Holder Folders that we featured here for Laura's Sketch 3. The latest ShortCuts product, Clear & Frosted Card Blanks, are ready-to-assemble-and-decorate card blanks that will help you create fingerprint resistant cards. Each of the stocks is made of a thick vinyl material (think clear/frosted cardstock). 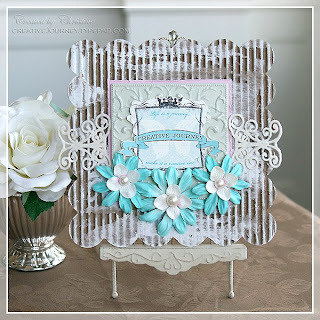 Unlike other flimsy products out there these cards can hold your embellishments without collapsing, as seen in these gorgeous artists samples created by one of our very own DT members: Carla Peicheff . Card of the Week and the FaB 5 Win! 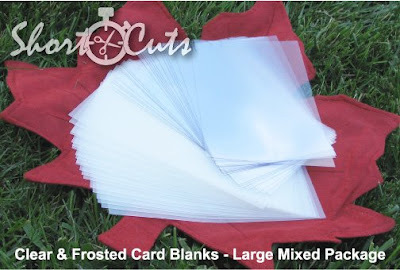 The main prize for Card of the Week is: Card Blanks - Mixed – Large Pack. 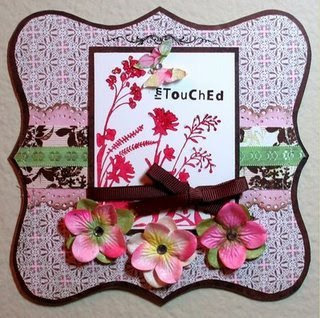 You will receive 20 card blanks in each of the two styles shown in the picture above (clear & frosted) – to decorate. 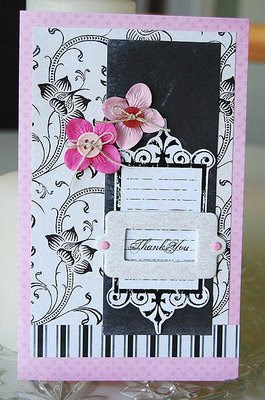 ShortCuts is also offering up a Card Blanks – Sampler Pack (2 blanks in each style) to each of the Fab Five this week!! • The winning card will be announced as the Card of the Week on Sunday, September 27st here at 2 Sketches 4 You. This a big week at 2S4Y! We cant wait to see your creations. Laura & The Pachyderm Loving Design Team! Don't forget to tune in tomorrow, Laura has an awesome sponsor to reveal with a product that I personally LOVE! We also have a special surprise for more than one of you *wink*! 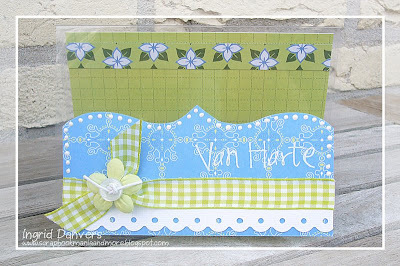 This fun Note Card holder with matching envelopes was created using my fabulous Scor-it. 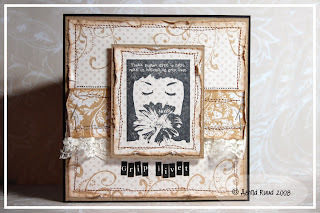 Please visit my blog: Nunu Toolies for a detailed tutorial on how to make this project. "When I craft I put on my Ipod, turn up the volume and sing LOUDLY.....when my kids enter the room...they laugh and tell me to stop, but I can't....it helps me think!!! Evidently...I can't sing very well!!! LOL!!!" I would like to welcome back Scor-it as the sponsor for this weeks sketch. With Scor-it you can create professional quality scores and embossed lines by hand. 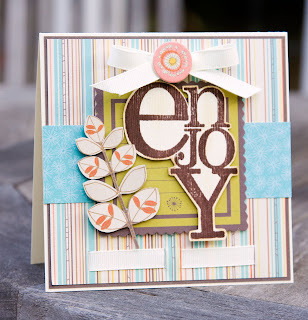 This nifty crafter's tool will score with, and against, the paper grain up to 24pt chipboard. You can score and emboss any paper stock, thin metals, plastics, synthetic and hand-made paper, metallic coated paper and much more. 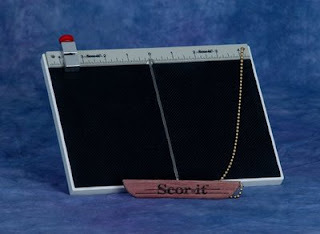 You can learn more about this fabulous product on their informative website: www.scorit.com. 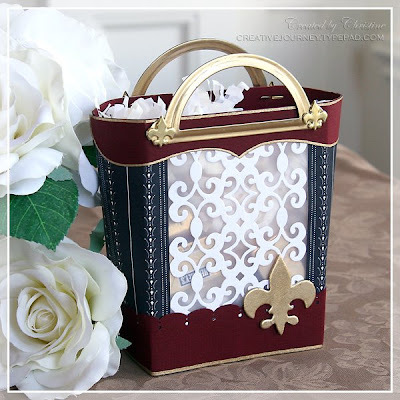 Here you can also view videos and webisodes on step-by-step projects and you can see their product line including new die-cut cards and envelops from the fabulously talented Teresa Collins. 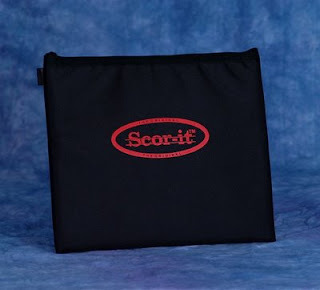 The best news is that Scor-it is giving a Scor-it Mini and a Scor-it Mini Tote Bag to the winner of Card of the Week! • The winning card will be announced as the Card of the Week on Sunday, September 21st here at 2 Sketches 4 You. Wow, another amazing week at 2S4Y! So much enthusiasm, talent & fun going on here. This is such a beautiful card Kristen. 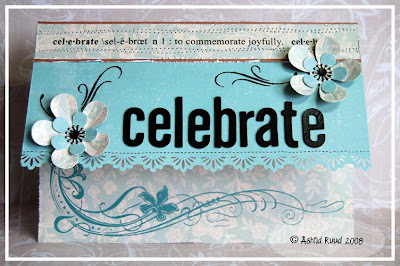 The colors are striking, with the perfect sentiment, "Thank You,"
Congrats! Please email me your address and I will send you your prize. Tomorrow's another fun week with a superb sketch & card by Kazan. Not to mention another great sponsor, our smiling design team and a very special guest designer too!